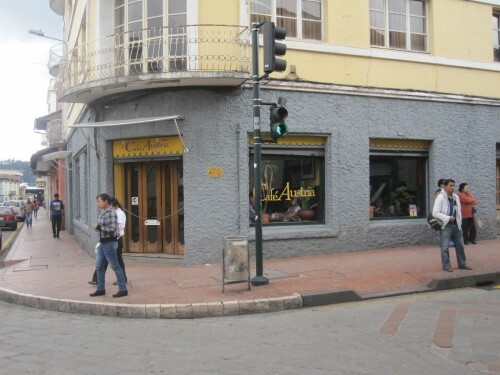 Located right in the heart of the old town between the main plaza and the famous Calle Larga, Cafe Austria is one of the top expat and foreigner hang outs in Cuenca. The Cafe has a small bar and wooden tables close together that provide a social atmosphere where people can meet and greet. For me, the Cafe has an Old West Diner feel to it, like the ones back home in Montana, USA. 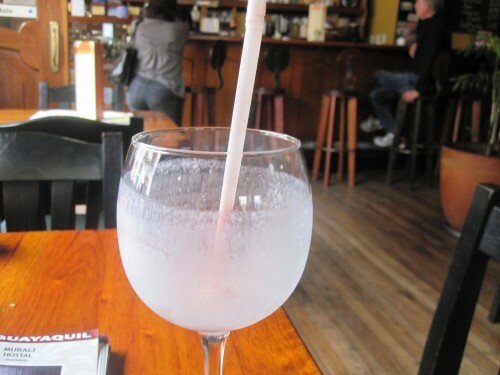 Happy Hour is 5-8pm Mon-Fri… drinks are half off. The menu is rather basic with salads, sandwiches, pastas, ice cream, desserts but the variety of cocktails available is impressive. Plate lunches are also served. The fruit smoothies with flavors like Mango-Peach-Strawberry and the desserts are the highlight and a must try. What was left of my fruit smoothie in Cafe Austria. Delicious!